People can drop off food donations at Superstore, Super A, Extra Foods and Shoppers in the Qwanlin Mall. 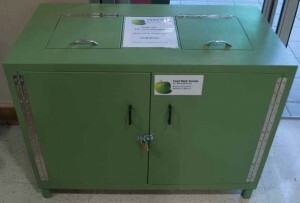 On your way out of the store, leave your donations in a green box like this one. See the list below of most needed items and consider adding some to your next grocery list! Each month we provide emergency food to help feed over 1200 people. The food we give a family of four (enough for three days) is worth about $120. We can’t do this without community support. Your donations help us feed families in need! You can donate food at the main grocery stores (Super A, Extra Foods, Superstore, Shoppers in Qwanlin) in Whitehorse that have a green-painted drop-off box near the exit. Or you can drop it off at the Whitehorse Food Bank during our hours of operation. If you give us your receipts when you drop off food, at the end of the year we’ll add up the value of your donations and issue you a tax receipt! Different businesses, schools and groups help out by collecting food in their own workplaces and organizations. You can also donate food on your own doorstep. Twice a year, we organize a city-wide food drive. Bags are dropped off at your door and then volunteers come around a few days later to pick up your donations, at a time noted on the bag. There are also many smaller food drives organized by school classes, businesses and other groups at different times of the year. They often collect food in their schools, workplaces or organizations and deliver the donations to the Food Bank. Below is a list of the things we put in our food hampers. These are the items we need the most! When we do not have enough donations of these items, we have to buy them. The Whitehorse Food Bank is located at 306 Alexander St. 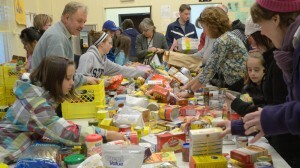 The Whitehorse Food Bank relies on your donations to feed people in need in our community. Visit our DONATE page to learn more. You can also donate online through Canada Helps. Click the blue button below!